This year, Forefront family members are challenging themselves to discern God’s specific calling on their lives, and to take steps to pursue that calling. We are all called together to follow after Jesus Christ in a life of Spirit-filled obedience as he advances the Kingdom of God through the Church … but what is the particular role which he has reserved for you, and equipped you to fill? 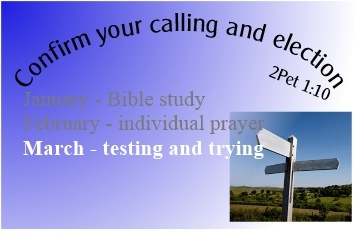 Each month, we are introducing new ideas to help us recognise how God has used us and spoken to us in the past, and what he may have for us in future. We started in January with study of the Bible to see how God speaks to his servants. In February we committed ourselves to individual prayer. In March, we look at the principle of ‘testing and trying’. Sometimes, we sense that God the Holy Spirit may be challenging us to do something new, something out of the ordinary. Spirit-led activity can (should!) happen on a daily basis, but the accumulation of daily adventures gradually points us toward new directions and opportunities. With that in mind, we are encouraging members to reach out into new areas from March, where they feel God may be guiding them. Join one of the Church teams as a volunteer for a season; or step out in a new ministry area, and ask your Life Group or accountability partners to pray with you. The feedback from wise counsellors – those in the ministry area and those who know us well – can help reinforce our personal understanding. Remember, we’re not trying to test God where he has clearly called us: rather, we want to test our understanding of how he is using us, where that is not yet clear.